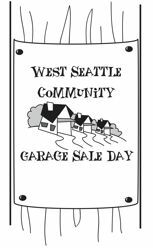 West Seattle Blog… | West Seattle Community Garage Sale Day 2019: Need someplace to sell? West Seattle Community Garage Sale Day 2019: Need someplace to sell? Got stuff to sell, but no yard? RENT A YARD HERE! We have a limited number of 10′ x 10′ spaces available on our lawn for a $25 donation. 1 six-foot table, 2 chairs included. Sell your own items, keep your profits! Table fee benefits our Resident Care Fund. Contact Danette via email: dutley@thekenney.org or call 206-937-2800. The Kenney is at 7125 Fauntleroy Way SW, just north of Lincoln Park. You’ll see it on the map, which will be available in clickable and downloadable/printable versions one week before sale day! No Replies to "West Seattle Community Garage Sale Day 2019: Need someplace to sell?"